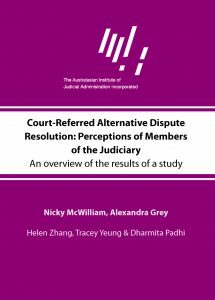 An overview of the results of a study examining judicial attitudes to court-referred alternative dispute resolution (CADR), drawing on data collated from 104 judges (including magistrates) from the three tiers of NSW Courts, the Federal Court and the Federal Circuit Court. The study consisted of a questionnaire and semi-structured interviews that examined judicial engagement, perceived impact and importance, understanding and the outcomes of CADR. The overall participation rate was 30 per cent, ranging from 15 per cent of the Local Court bench, to 45 per cent of the NSW Supreme Court. The courts studied each have different functions and preside over disparate work requiring distinct CADR processes, but analysis reveals some important consistencies across these courts in relation to CADR, particularly a general engagement with CADR across the judiciary. The overall results suggest that judges across the courts do consider CADR. The positive experience overall, even where some judges saw CADR as slightly increasing rather than decreasing their workload, confirms the potential for CADR to improve the efficiency, accessibility and outcomes for the courts.